This page has some background information on what it took for me to climb Everest based on my own experiences. What do you wear when the temperature goes from 100° F to 10° F in a matter of minutes? Oh and you have to carry everything in your backpack. Oh and the wind may go from calm to gale force. Ok, let’s not forget a blinding whiteout. Exaggeration, Hyperbole? No, it is the Western Cwm on Everest’s South Col route. Clothing is one of the most important investments high altitude climbers make. It literally becomes a matter of life and death during the climb. The short answer to the dilemma is layers. In other words a well thought out system of varying weight layers of clothing that are easily removed or added as the conditions change. There are three basic levels: wick, warmth and wind/snow. Let’s take them one at a time. Removing the moisture from your skin is the key to maintaining a warm, comfortable and safe climbing environment within your clothing. There are several ways to manage this moisture. Most climbers were very lightweight capiline or merino wool, which I prefer, next to the skin. This layer wicks the moisture away from the skin and, hopefully, evaporates. The other advantage of this layer is that is dries quickly. You always hear never to wear cotton while climbing, this is because it does not wick nor dry. A layer of wet clothing against your skin can accelerate hypothermia, frostbite and even death. Many climbers have suffered this fate thus the importance of the base layer. The next layer is for warmth. There are many choices here depending on personal preference and/or conditions. I like a medium weight pull over top or a full body suit such as the Mountain Hardwear Powerstretch suit. It is made of a medium weight fleece that breathes thus allowing moisture wicked away from the skin to pass through. Many climbers use fleece jackets and pants. The final layer is for protection against wind and snow. The standard for high altitude is down. There are two approaches - a full down suit or separate down jacket and pants. The full suit has the advantage of no gaps at the waistline. This is important when you are bending over to clip in or reaching for difficult holds. In high winds, this gap can “leak” and destroy your carefully designed cocoon. You can also sleep in a full suit and bring a lighter sleeping bag to the High Camps. The disadvantage is that when it warms up, you cannot easily strip down. The standard procedure is to pull the top down and wrap the arms around your waist. This is very bulky and is still hot. 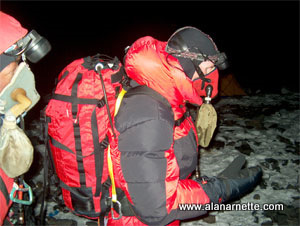 A separate down jacket has the advantage that it can be used in camps, during rest stops and during the climb. Paints have the same advantage. Down is the warmest insulating material but becomes useless when extremely wet. Primaloft or synthetic down avoids this problem but is not as warm. Most climbers select down for their critical layer at high altitudes. Some climbers incorporate a gortex jacket and/or bibs as an outer layer in strong wind conditions where it is not extremely cold. Finally, protection for the hands, head and feet complete the system. Again, layers apply here as well. I cover boots below but the summary are wool socks, double insulating boots and integrated gators to keep the snow out. Hands are protected with lightweight “liner” gloves followed by a wind stopper type material on a heavier glove. And for the highest altitudes down mittens – not gloves – that create an inner air space to keep fingers warm. The head is usually protected with a knit skull cap made of windstopper material. As conditions get worse a full balaclava that covers the nose. A neck warmer is a must. Finally the down hood from the suit or jacket competes the cover. Glacier sunglasses that block 99% of the harmful light is a must sometimes combined or replaced by goggles in windy and blowing snow conditions. As you can see, there are many levels, pieces and approaches that go into the climbing cocoon. It is expensive to get all this gear and also takes some time to get used to wearing the right layer for the conditions. The goal is always not to be too hot or too cold. Click here for a complete list of all my gear. How do you train your body to withstand a third of the oxygen in every breath, every muscle screaming for more blood while your insides literally are dying while you sleep? Perhaps an even better question, other than why, is how do you train your mind? Veteran Everest climbers know what they will experience. First time climbers are shocked at the experience. My personal experience was difficult. I experienced a lung infection that stopped a climb and on another, my body simply refused to acclimatize above 23,000’. With the clear disclaimer that I am not a doctor and everyone should visit their own Doc before entering any kind of Everest training program, let’s talk from experience. Also there are many programs out there so this is just what I like for myself. So what is the best way to train your mind and body to make the top … and return, safely? There are many approaches to athletic training all the way from the nightly jogger to the weekend warrior to dedicated amateur to the professional. Often it boils down to time and motivation. The vast majority of Everest climbers have full time jobs, full time families and cannot spend several hours a day for a year to get in professional shape. The professional or highly dedicated will speak of VO2 max which is the maximum rate your body can move and use oxygen during periods of high stress or need. Another couple of terms are anaerobic threshold (AT) and lactate threshold which is when the chemical lactate acid begins to build in your blood stream and muscles thus preventing the body from functionally at full capacity. A qualified doctor or trainer can measure these levels through a series of treadmill and blood tests. However, the essence of these measures and tests is to determine how to get red blood cells to your muscles and that is the key to climbing Everest. There is a third of the available oxygen on the summit of Everest thus making your heart, lungs and muscles cry out for more oxygen during the climb. Red blood cells, which carry oxygen rich blood to muscles, are increased in response to this lack of oxygen. However this takes time thus the acclimatization process where you “climb high, sleep low” to encourage the production of these red friends. Training before you get to Everest must begin 12 to 18 months with a focused, intense and balanced exercise program – after a check up from your Doc. In my mind there are three major phases: foundation, aerobic/strength and peaking. The major groups to work on include: heart, lungs, abs, lower back muscles, thighs and calves. Proper footwear is one of the most important choices when climbing Everest. And, it is fairly simple. But it is also bewildering. Not only must you choose the style but also the socks, warmth and the unknown. The most common boots used on Everest today are models that incorporate an insulating inner boot and a hard outer boot. The two most popular boots are the Olympus Mons Evo by La Sportiva and Millet’s Everest GTX aka Everest One Sport. These boots also have an integrated gator thus simplifying getting dressed in the morning and providing a closed environment for your foot. I used the La Sportiva, MIllet and Kayland models for many climbs and never, ever got cold or wet feet. 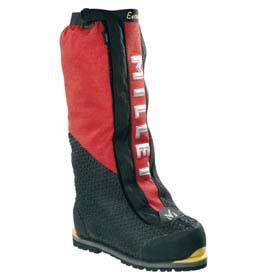 Another options used by some climbers is a warm climbing boot such as Koflach’s Artic Expe. It also has an inner boot that fits snugly inside the hard outer boot. Some climbers use an outer boot for maximum warmth in extreme temperatures. I also have used this boot on Denali and Aconcagua with no problems and with and without the outer boot. The key to all these models is the inner boot. It is a soft, space-age material, Aveolite, that feels like a slipper but is extremely warm. Some climbers are starting to add even more warmth, however by stealing a page from skier’s book. Hotronics is a foot bed warmer that is battery operated. I have used it successfully on Everest and Manaslu. As for socks, most climbers wear at least a thin wool sock and a heavy outer sock from companies such as Smartwool. Some prefer two thick socks but the key here is to buy the boot large enough to accommodate all that bulk. As for the bewildering part? Feet swell at altitude and especially after long days. But how much? And do you buy a boot assuming yours will or will not? My experience has been to buy a size larger and find socks that fit you well. The final part of the footwear decision are crampons – you know those spikes that keep you attached to the mountain– hopefully! My choice are models from Black Diamond such as the Sabertooth Pro. These are 12 point models with 2 of the points sticking out from the front used to grip steeper slopes or ice. This model comes with a plastic insert that reduces snow buildup under your foot and potentially eliminating the advantage of the crampon in the first place. All this technology has a price. Boots will run between $500 to $850. Socks, $20 a pair. And another $190 for the crampons. A grand total of perhaps $1000! But then again, how much are your toes worth? One of the most important decisions climbers make when planning an Everest climb is the use supplemental oxygen. This is harder than it seems. For some climbers they will never use bottled oxygen since it creates a dependency on a system that could fail thus increasing your risks above 8000m. Others feel it is cheating - if you cannot climb without it you should not be there. This debate has gone on since the practice started with the Swiss Everest climbs in the early 1920's and continues today. In any event, the vast majority of climbers today use some form of supplemental oxygen. But note that it makes an effective difference of about 3,000' on how your body feels. So at 26,000' you still feel like you are at 23,000 feet! So why use oxygen at all? First, the science. The air we breath has a mixture of gases including oxygen and nitrogen. The atmosphere contains about 21% oxygen at all altitudes. What changes as we go higher is the air pressure. Gravity pulls on gas molecules in the air. The closer to the Earth's surface, the more pressure. At the summit of Everest, the pressure was measured in 1981 by a Nova team at 253 mmHG. At sea level it is 760 mmHG. The reason for the lower pressure is that there is less atmosphere pushing down from above. This reduced pressure allows the air molecules to scatter. This means that on Everest the air is not as dense or "thick". In other words there is the same amount of oxygen but the molecules are scattered thus the term "thin air". So in each breath there is less oxygen. To be precise about 66% less! The critical benefit of using bottled oxygen is warmth. By reducing the work the heart and lungs have to do to keep your core warm, blood continues to flow to toes and fingers thus reducing the risk of frostbite. Climbers have a few choices of systems. The first is the traditional approach using a pilot's face mask and the Russian POISK system. The POISK system use bottles filled at the factory in St-Petersburg, Russia (be careful of fraud with claims that bottles are new but are refilled in non-certified facilities). The oxygen is delivered through a regulator to a tube to a face mask that provides a constant flow of oxygen. They hold about 720 liters of oxygen and weigh about 5.6 lbs. Climbers usually run their flow at 2 liters per minute and count on getting about 6 hours out a bottle. If they use more flow - 3lpm the bottle only last 4 hours. Most expeditions will use POSIX cylinders. I used the Poisk system on Cho Oyu in 1998 and Everest in 2002 and 2003. POISK has updated their mask design but the old models leaked and fit poorly to a climber's face. The mask from Top Out is a popular as a replacement for the POSIX masks as it offers an improved mask design and uses an external reservoir. The separate reservoir claims to meet instant demands but in my experience the most significant improvement is that the mask fits tightly to the face preventing leaks. It works with the POISK oxygen bottles and regulators. I used it on my 2011 Everest summit with good success however, the mask lines did freeze up on my descent of the Hillary Step and it took a good fist blow from my Sherpa to clear the ice. This is actually a serious issue that several of my teammates also experienced. A fast rising entry on the market is from Summit Oxygen. I used it very successfully on Manaslu in 2013. Neil Greenwood’s Summit Oxygen offers a complete system: mask, regulator and cylinder. It was designed from the ground up using the latest technology. He continues to improve it with incremental improvements. The complete system of cylinder, valve, regulator, and mask in the lightest weight system on the market. Most expeditions will assume 5 to 7 3L bottles per climbers on Everest. It takes a lot of work to get the bottles positioned on the mountain. Sherpas usually cache some at C3, South Col, Balcony and the South Summit. Obviously they are used for the summit as well as the descent. Due to Nepal regulations on the south side, all the bottles are carried down and reused for future expeditions. The days of littering the mountain are hopefully gone forever. That said, real effort is needed to clean up the north. On summit night, climbers put one or two bottles in their packs. The rubber tube runs over their shoulder to the mask. Some mask models interfere with visibility in that it is almost impossible to see your feet. This makes you go even slower! And the older mask designs are not 100% sealed around your face, air escapes fogging up goggles, precious oxygen leaks from the gaps and there is no capacity to provide extra oxygen "on-demand" during big moves. Gasping for breath, struggling to see where you are stepping or hauling an extra 13lbs in the Death Zone is uncomfortable. But very few climbers would trade the discomforts for that extra 3000 feet! I have been to the Everest region nine times and the Khumbu cough was my constant friend each time. Friend is a nice way of saying a constant companion - an annoying one but nonetheless a companion. BasecampMD, the website of the medical clinic staffed each spring on the south side of Everest at base camp, has a nice medical explanation and article about the cough. Basically it occurs when air brought into the lungs is too cold and too dry. Thus the lining of the lungs become inflamed and lose their ability to expel moisture and small particles. Bottom line is that in addition to an incredibly annoying cough, it hurts to breath. You may say, so how bad can a cough be? Well, bad enough that you cannot sleep, ribs can get broken, you cannot breath when climbing and bad enough that all your climbing partners make you sleep in the toilet tent! But for me, it turned into a lung infection that killed any hopes of a summit in 2002. I clearly remember standing at 27,200' between the Balcony and the South Col, violently coughing, dry heaving and finally having zero energy to take another step. "Finally, as we approached the level of 28,000 feet [8534 m], the summit being only half a mile away or less, I felt that, as far as I was concerned, it was hopeless to continue. I told Norton that he had no chance of the summit with me. My throat was not only extremely painful, but was getting almost blocked up—why, I knew not. . . . Somewhere about 25,000 feet [7620 m] high [on the descent], when darkness was gathering, I had one of my fits of coughing and dislodged something in my throat which stuck so that I could breathe neither in nor out. I could not, of course, make a sign to Norton, or stop him, for the rope was off now; so I sat in the snow to die whilst he walked on, little knowing that his companion was awaiting the end only a few yards behind him. I made one or two attempts to breathe, but nothing happened. Finally, I pressed my chest with both hands, gave one last almighty push—and the obstruction came up. What a relief! Coughing up a little blood, I once more breathed really freely—more freely than I had done for some days." For those headed up there this year, the only advice I can offer is to wear a mask or bandanna over your mouth from Namche on. Use hard candy to keep your mouth moist, try to breath though your nose as much as possible and stay hydrated. Check out the BasecampMD site for more ideas. Is predicting the weather an art or science? According to Michael Fagin at EverestWeather.com it is both. Michael, a climber himself and a meteorologist by training, has provided weather forecasts for Everest climbers for may years. Ed Vestures exclusively relied on Michael's forecasts during his successful summit of all 14 8000m mountains. Michael and team look at 6 different models to come up with a single forecast. They provide forecasts for most major climbing venues: Himalayas, Alps, Denali Caucasus, Karakorum, Andes and the US Cascades. I asked him just how hard is it to forecast the weather on Everest and how stable is the so-called "summit window" we hear about late in each season. As Everest followers know, this is that tiny break in the weather when the jetstream moves north thus reducing the fierce winds on Everest's summit. Climbing teams wait for days or sometimes weeks for that window to appear. Michael, Can you explain what is going on with the "window"? That is the million dollar question, not that I get a million dollars to do the forecast but I could if I could get this right every time. However, on second thought I truly doubt if I would ever come close to that figure even if I were perfect. I’m going to answer this question in multiple ways as it depends on teams needs. Here is an example. Not that a group would be unsafe but if it is towards the end of the season, end of May, the group might be much more amendable of so so summit conditions; winds at 25 to 35 knots vs. winds of 10 knots. It also depends on the strength of the group. Stronger teams could handle the higher winds. Predicting when the winds are within “safe summit conditions” is “relatively” not difficult. So predicting winds in the 25 to say 35 winds is not that difficult to predict as compared to the “perfect summit conditions”. However, sometimes the winds get stubborn and stay at the 40 knot range. Finding that “perfect window“ is certainly a forecast challenge. Perfect wind being winds at say 6 to 20 knots is extremely difficult. For one thing we are talking about winds in the jet stream (Everest summit) and this is the region where the winds in much of May in some seasons exceed 100 knots. So, there just a few days in the year when winds are below 10 knots. Another challenge is forecasting models do not seem to resolve the wind speeds of 10 to 30 knots that well. The models many times put the winds in the 10 to 35 knot range. Finally as a forecaster I have to be really careful in forecasting 10 knot winds. I have seen many times when the forecast models show winds of 10 knots and they are 40 knots. so, I have seen many times when the forecast models show winds of 40 and they are at 10 knots or even calm. How long have you been predicting the weather for Everest? My first forecast was in the spring of 2003. With that being the 50 anniversary of the first summit of Everest I thought that was a good time to start. Another reason I started then was some climbers wanted a forecast for of 2003 so I thought I should get the Everest weather forecast models tuned up first. How difficult is it to predict Everest weather? - While many locations have real time weather observations Everest does not so it makes it difficult to get an exact read on what the real time weather is like. Of note there was a weather station set up on the South Col several years ago but it was difficult to keep the station running and there were some security (theft) issues. - When a tropical storm moves in from the Bay of Bengal this type of pattern can produce copious amounts of precipitation. The problem is the forecast model output is very unreliable and at times totally understates precipitation amounts and understates the wind. - During the post monsoon season, September and October, is tricky since the forecast models do not give a lot of advance warning when the drier and stronger winds kick in. How do climbers get your forecasts? I deliver in multiple ways: email to laptops, short text messages to sat. phones, leave voice mail recordings on their phones, fax forecast to office and office sends to climbers, and they can call in to get the forecast. This image was taken from the International Space Station on January 28, 2004 using an 800mm lens from 200 miles above the Earth. It shows Everest (dead center of image)from the north. You can clearly see the North Face, the Western CWM, Lhotse Face and Lhotse. The large peak on the left of the image is Makalu, 27,765' or 8,462m. Cho Oyu 26.907' or 8201m is on the right middle edge. Ama Dablam is in the upper middle quadrant - bonus points for finding it! You can read more about this shot on the NASA website. Mt. Everest was first summited by Sherpa Tenzing Norgay and New Zealander Edmund Hillary with a British expedition in 1953. They used the South Col route. At that time the route had only been attempted twice by Swiss teams in the spring and autumn of 1952. They reached 8500m well above the South Col. Of note, Norgay was with the Swiss thus giving him the experience he used on the British expedition. The Swiss returned in 1956 to make the second summit of Everest. Here is a typical south side climb schedule showing average time and the distance from the previous camp plus a brief description of each section. More details can be found on the South Col route page. Home away from home. Located on a moving glacier, tents can shift and platforms melt. The area is harsh but beautiful surrounded by Pumori and the Khumbu Icefall with warm mornings and afternoon snow squalls. With so many expedition tents, pathways and generators, it feels like a small village. Reaching C1, is the most dangerous part of a south climb since it crosses the Khumbu Icefall. The Icefall is 2,000' of moving ice, sometimes as much as 3 feet a day. But it is the deep crevasses, towering ice seracs and avalanches off Everest's West shoulder that creates the most danger. The trek from C1 to C2 crosses the Western CWM and can be laden with crevasse danger. But it is the extremely hot temperatures that takes a toll on climbers. 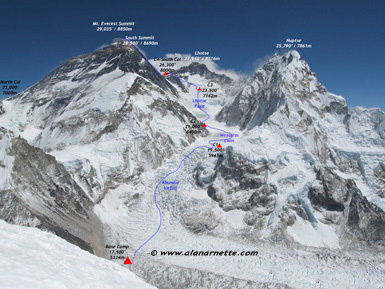 Again avalanche danger exist from Everest's West Shoulder that has dusted C1 in recent years. Climbing the Lhotse Face to C3 is often difficult since almost all climbers are feeling the effects of high altitude and are not yet using supplemental oxygen. The Lhotse Face is steep and the ice is hard. The route is fixed with rope. The angles can range from 20 to 45 degrees. 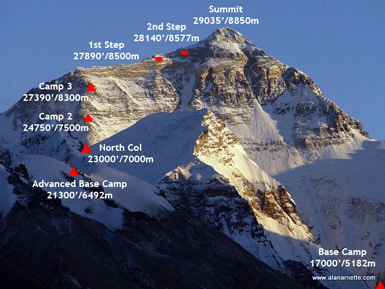 It is a long climb to C3 but is required for acclimatization prior to a summit bid. The route to the South Col begins at C3 and across the Yellow Band. It starts steep but settles into a sustained grade as the altitude increases. Climbers are usually in their down suits and are using supplemental oxygen for the first time. The Yellow Band's limestone rock itself is not difficult climbing but can be challenging given the altitude. Bottlenecks can occur on the Yellow Band. This section can be a surprise for some climbers. The top of the Spur leading onto the South Col has some of the steepest climbing thus far. It is easier with a good layer of snow than on the loose rocks. Welcome to the moon. 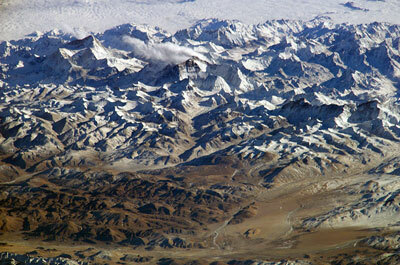 This is a flat area covered with loose rock and surrounded by Everest to the north and Lhotse on the south. Generally, teams cluster tents together and anchor with nets or heavy rocks against the hurricane force winds. This is the staging area for the summit bids and the high point for Sherpas to ferry oxygen and gear for the summit bid. Officially now on Everest, climbers are using supplemental oxygen to climb the steep and sustained route up the Triangular Face. The route is fixed with rope and climbers create a long conga line of headlamps in the dark. The pace is maddeningly slow complete with periods of full stop while climbers ahead rest, consider the decision to turn back or continue to the balcony. It can be rock or snow depending on the year. Rock fall can be an deadly issue and some climbers now use helmets. They swap oxygen bottles at the Balcony while taking a short break for some food and water. The climb from the Balcony to the South Summit is steep and continuous. While mostly on a beaten down boot path, it can be challenging near the South Summit with exposed slabs of smooth rock in low snow years. The views of Lhotse and the sun rising to the east is indescribable at this point. One of the most exposed section of a south side climb is crossing the cornice traverse between the south summit and the Hillary Step. But the route is fixed and wide enough that climbers rarely have issues. The Hillary Step is a short 40' section of rock climbing, again fixed with rope, that creates a bottleneck on crowded summit nights. Usually there is an up and down climbing rope to keep people moving. The last section from the Hillary Step to the summit is a moderate snow slope. While tired, climber's adrenaline keep them going. Care must be taken to avoid a misplaced step down climbing the Hillary Step, the Cornice Traverse or the slabs below the south summit. Also diligent monitoring of oxygen levels and supply is critical to make sure the oxygen lasts back to the South Col.
Usually climbers are quite tired but happy to be returning to the higher natural oxygen levels regardless of their summit performance. It can be very hot since most climbers are still in their down suits. Packs are heavy since everything they hauled up over the preceding month must be taken back down. It is now almost June so the temperatures are warmer making the snow mushy thus increasing the difficulty. But each step brings them closer to base camp comforts and on to their home and families. The north side of Everest is steeped in history with multiple attempts throughout the 1920’s and 1930’s. The first attempt was by a British team in 1921. Mallory led a small team to be the first human to set foot on the mountains flanks by climbing up to the North Col (7003m). The second expedition, in 1922 reached 27,300′ before turning back, and was the first team to use supplemental oxygen. It was also on this expedition that the first deaths were reported when an avalanche killed seven Sherpas. The 1924 British expedition with George Mallory and Andrew “Sandy” Irvine is most notable for the mystery of whether they summited or not. If they did summit, that would precede Tenzing and Hilary by 29 years. Mallory’s body was found in 1999 but there was no proof that he died going up or coming down. A Chinese team made the first summit from Tibet on May 25, 1960. Nawang Gombu (Tibetan) and Chinese Chu Yin-Hau and Wang Fu-zhou, who is said to have climbed the Second Step in his sock feet, claimed the honor. In 1975, on a successful summit expedition, the Chinese installed the ladder on the Second Step. Tibet was closed to foreigners from 1950 to 1980 preventing any further attempts until a Japanese team summited in 1980 via the Hornbein Couloir on the North Face. The north side started to attract more climbers in the mid 1990s and today is almost as popular as the South side when the Chinese allow permits. In 2008 and 2009, obtaining a permit was difficult thus preventing many expeditions from attempting any route from Tibet. Now let's look at typical north side schedule showing average time from the previous camp plus a brief description of each section. More details can be found on the Northeast Ridge route page. located on a gravel area near the Rongbuk Monastery, this is the end of the road. All vehicle assisted evacuations start here. There are no helicopter rescues or evacuations on the north side or for any mountain in Tibet. Used on the first trek to ABC during the acclimatization process, this is a spot where a few tents are placed. Usually this area is lightly snow covered or none at all. Many teams use ABC as their primary camp during the acclimatization period but it is quite high. This area can still be void of snow but offers a stunning view directly at the North Col. It is a harsh environment and a long walk back to the relative comfort of base camp or Tibetan villages. Leaving Camp 1, climbers reach the East Rongbuk Glacier and put on their crampons for the first time. After a short walk, they clip into the fixed line and perhaps cross a few ladders that are placed over deep glacier crevasses. The climb from ABC to the North Col steadily gains altitude with one steep section of 60 degrees that will feel vertical. Climbers may use their ascenders on the fixed rope. Rappelling or arm-wrap techniques are used to descend this steep section. Teams will spend several nights at the Col during the expedition. Mostly a steep and snowy ridge climb that turns to rock. High winds are sometimes a problem making this a cold climb. 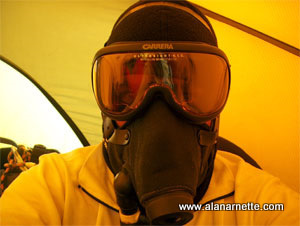 Some teams use C2 as their highest camp for acclimatization purposes. Teams place their Camp 3 at several different spots on the ridge since it is steep, rocky and exposed. Now using supplemental oxygen, tents are perched on rock ledges and are often pummeled with strong winds. This is higher than the South Col in altitude and exposure to the weather. It is the launching spot for the summit bid. The first of three rock features. The route tends to cross to the right of the high point but some climbers may rate it as steep and challenging. This one requires good foot work and steady use of the fixed rope in the final gulley to the ridge. A rock feature that spotters and climbers can use to measure their progress on summit night. Oxygen is swapped at this point. The route can be full of loose rock here adding to the difficulty with crampons. Climbers will use all their mountaineering skills. This is the crux of the climb with the Chinese Ladder. Climbers must first ascend about 10' of rock slab then climb the near vertical 30' ladder. This section is very exposed with a 10,000' vertical drop. It is more difficult to navigate on the decent since you cannot see your feet placement on the ladder rungs. This brief section is notorious for long delays thus increasing the chance of frostbite or AMS. A steep snow slope, often windy and brutally cold, climbers feel very exposed at this point. Towards the top of the Pyramid, climbers are extremely exposed again as they navigate around a large outcropping and experience three more small rock steps on a ramp before the final ridge climb to the summit. The final 500' horizontal distance is along the ridge to the summit is quite exposed. Slopes angles range from 30 to 60 degrees. The down climb takes the identical route. Early summiters may experience delays at the 2nd Step with climbers going up or summiters having down climbing issues. Packs can be heavy since everything hauled up over the preceding month must be taken back down. It is now almost June so the temperatures are warmer making the snow mushy thus increasing the difficulty. But each step brings them closer to base camp comforts and on to their home and families. Each year is different on Everest. The temperatures can be colder or hotter, winter snows more or less and of course, the wildcard is when the jet stream moves off the summit. Predicting Everest weather is difficult at best. Experts around the world send daily updates to expedition leaders who analyze the reports as compared with what they are seeing. When the winds are predicted to be under 25 m.p.h over a 48 hour period, teams set off for the top of the world. So which side is easier? As I always say, pick you poison. The south has the Icefall; the north the exposed northeast ridge and the Steps. In spite of the Icefall dangers, I think most operators will say the south side is safer and slightly easier. One sobering statistic backs up this advice - more climbers, by a 2:1 ratio, have died on the north than the south since 2000 as I explained in this earlier post. But the real answer is no one knows for certain what each season will bring. So train hard, get skills on low mountains and altitude experience on another 8000m mountain before Everest and go with a team you can count on in an emergency.